Now that summer has officially arrived in the Lowcountry, there are some timely real estate matters we'd like to discuss: namely, termites. Whether you're buying or selling a home, the role termites can play in a transaction is extremely important. Here we'll break down the different things to be on the lookout for. But first, a little history on the specific type of termites that inhabit our corner of the world, because this is Charleston after all, and even the insects have an interesting past. There are several types of termites present in the Charleston area: the Formosan termite as well as native species. The one that you really want to look out for is the Formosan as they tend to make larger colonies than native species. How did this dreaded species of termite arrive in Charleston? According to the Post and Courier, they "arrived in Charleston in the mid-1950s, hidden in ships' cargo from Asia. That's why areas close to the former Navy base and the port -- including The Citadel and the nearby Wagener Terrace neighborhood -- are prominent targets." In fact, Formosan termites were first identified on the continental United States in Charleston in 1957. 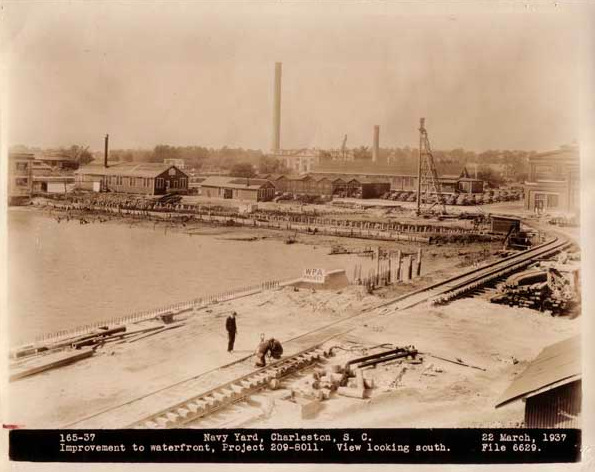 Other influences on current termite infestations were Hurricane Hugo and the development of Daniel Island. For example, Citadel Square Baptist Church has had to close their beautiful 1850s sanctuary because of a termite infestation in the upper beam and support work that may have been related to leaky roofs after Hugo. It’s one of Charleston’s oldest churches and on the Preservation Society of Charleston’s Seven to Save list of endangered local structures. Have you recently noticed large swarms of insects around streetlights or discarded wings on your window sills? Especially after a heavy rain? The period from Mother’s Day to Father’s Day (this Sunday, don’t forget) is appropriately referred to as ‘swarming season’ in Charleston. The swarmers are reproductive termites who leave their nests try to start a new colony. They are poor fliers and are often carried by the wind; when they land, they drop their wings and look for a mate. Sometimes after a heavy rain it looks like a termite takeover! But just because you see swarmers doesn’t mean you have a termite problem. According to the Clemson Extension, there’s no need to fear Formosan termites as long as you properly respect them and take action to protect your property. If you're selling your home and a termite letter is part of the contract, the buyer's lender will request to see a clear CL-100, which is the wood infestation report for South Carolina. We briefly touched on this topic in our "Contract to Closing" information, which you can find here. If you have any questions, please don’t hesitate to get in touch! While we know that termites can be beneficial recyclers of dead trees, we’d rather keep our historic homes and buildings intact. So, y’all be sure not to let those termite bonds lapse!